THE SCENE: 56 and crisp with a shooting star during the workout! 11’s at the end of the parking lot where the hill is that goes down to the ball field. At the bottom, start with 1 monkey humper (4 ct) Bernie up and do 10 big boys. Do this until the script is flipped. Total QUAD smoke fest! Capri lap to loosen the quads up. Circle up, lock shoulder to shoulder in a circle with the pax and perform calf raises, straight, out, and in X 20 on the 4ct for each directions. Good ole calve smoke fest and with the pax resting on each other, it provides more resistance. TOTAL reps during captain spectacular is 55 inch worm merkins, 220 goblet squats and 220 over cmu overhead presses. A really good anaerobic workout I might add! You haven’t tested your limits until you try something you can’t do! The best day is today because yesterday is gone and tomorrow is not guaranteed. we got close to finishing the deck of cards. Lots of suicides and merkins in the front end of the stack ! Deck of cards is always great because you never know what is coming next. Let’s keep leading ! The only way to get better is to practice. 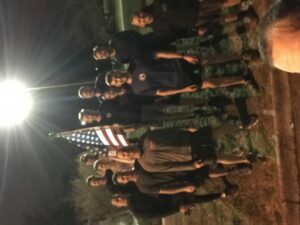 Sign up to Q not only at the Bombshelter but sign up to Q at another AO and lead a group of men you don’t know . It will only help you be a better leader. Woodshack led the warm up, Snorkel called the thang!